Rick Perry has now been elected to his final term as governor. If he serves out all of his new term, his time in governor’s office will span from December 21, 2000 to January 2015. You can add another decade to his full-time government service before that since he had been elected Agriculture Commissioner in 1990 before being elected Lt. Governor in 1998. Fourteen years in the Governor’s office as part of almost quarter century in state-wide office will certainly be enough for him, especially for an increasingly anti-government politician. Asking for another term as governor seems unlikely. Perry’s new book and book tour reveals a clear interest in national politics. He has often denied interest in running for the presidency but been more coy about the vice presidency. Whatever his goals, it is clear that Perry is focusing on national issues and national politics beyond simply blaming the Obama administration for everything. The Texas connections is not going to catapult him to the top of the presidential field for several reasons. First, most Americans aren’t looking to Texas for leadership after George W. Bush. Yes, a few people have put up a “miss me yet?” signs out, but those are protests against Obama and George W. Bush’s disapproval rate is high. Bush might deserve more credit than he is given, but McCain ran away from him for a reason. Also, we (Texans) need to accept something: Texas charm isn’t always so charming to everyone. Texas style isn’t always in style. 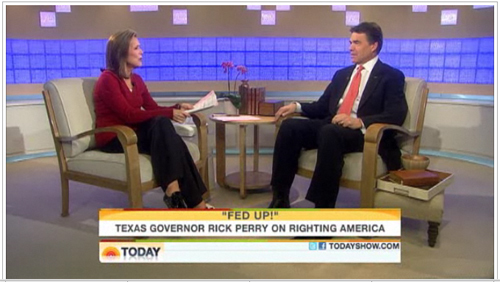 Perry can put away his boots, but he’s really not Rick Perry without some of that Texas style. In any case, the Republican Party has little need for a Texan on their ticket. 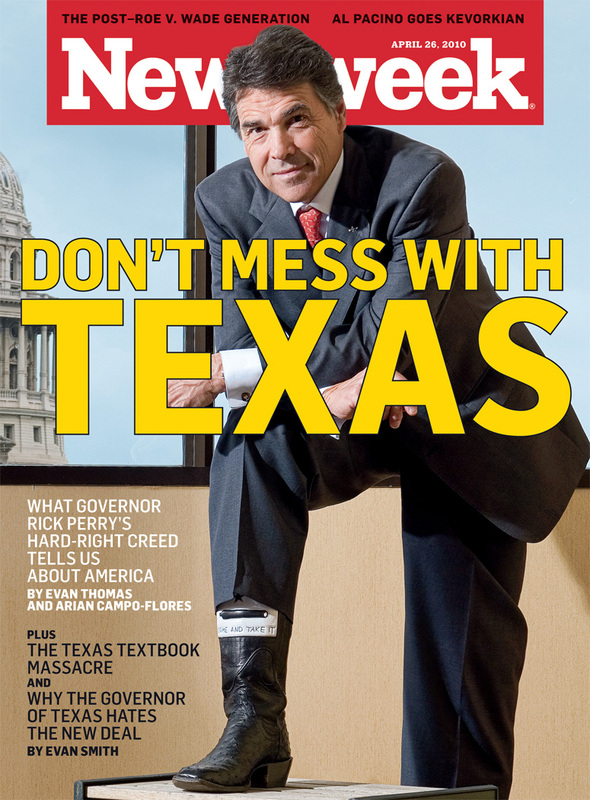 If the GOP needs a Texan as a vice presidential candidate to carry Texas in 2012, they’ve got much bigger problems. Texas is one of the nation’s most solidly Republican states and the political advantages of having some candidate from that state are minimal. The same is true for pretty much all of the south. Perry’s contribution to a Republican ticket would have to be all Rick Perry and no geography. Perry’s personal appeal may not be that strong. Perry has now peaked at winning 55% of the vote. However, he did so in a heavily Republican state in one of the best years for the party in decades. Also note that he finished at least 5% behind almost every other Republican state-wide candidate. (The only exception was Republican David Porter whose candidacy for Texas Railroad Commission was considered weak after he defeated incumbent Victor Carrillo in the primary, leaving some to question whether primary voters were voting against a Hispanic last name. Carrillo called Porter a “unknown, no-campaign, no-qualification CPA” and plenty of independent observers thought his resume wasn’t well suited for the position. Porter only polled 4.5% better than Perry.) Straight-ticket voting was high in 2010 and carried many Republicans to victory, with straight-ticket Republican votes totaling 40% in some areas. The GOP field was strong, but Perry trailed it. Texans reelected Perry, but they’re just not that into him. According to exit polling, Perry carried the vote of 81% of conservatives in Texas (as well as 36% of moderates at 13% of liberals). Much of the conservative base regards Perry with some suspicion. While he won their vote, their enthusiasm is often muted. Perry did well enough to win, but he failed to completely lock down his base or reach out to moderates. The Republicans will be looking for more from their national candidates. Perry’s policy resume is a little thin. Perry’s main claim to fame is keeping taxes low, balancing the budget, and bringing jobs to Texas. However, much of the credit for low taxes goes to the Legislature and Perry’s skill at crafting tax packages hasn’t been great. The franchise tax is underperforming and that’s contributing to the state’s large budget shortfall. Tough decisions are going to have to be made in Texas. If Perry had any popular solutions for the state’s budge woes, we would have heard about them during the campaign. Perry can’t credibly claim to trim fat from a state agencies his appointees have been running for a decade and any unpopular programs would have been cut in earlier financial crunches. The GOP field doesn’t need a Rick Perry. Perry is an anti-Washington Republican–a category that includes pretty much every Republican. What does Rick Perry say to social conservatives that Mike Huckabee can’t say better? How does Perry appeal to business-oriented Republicans any better than Mitt Romney? How can Perry package his 25 years in office to make himself look like an outsider next to someone like Sarah Palin? So, why is Perry on the book tour? Why do we keep hearing talk about a Perry candidacy? There are several reasons. Some of his campaign staffers likely continue to push Perry toward the national stage because they’re invested in him and he’s their ticket to the next level. Like the agents for a fading Hollywood star or declining athlete, some of Perry’s camp have tied their fortunes to him. I’ve been to the horse races enough to know that you don’t tear up you ticket until they’ve officially announced the winner. Perry’s staff will continue to whisper to him about the White House since that’s the only way their ticket to Washington is getting punched. Others in the Perry camp remain too enamored with their candidate to ever see his flaws. They see him as perfect and they are simply awaiting everyone else to see that as well. Perry likely understands all this. His hopes and ambitions can’t blind him to certain realities. However, Perry has other reasons to stay in the game even if he’s a long shot. The problem for Perry is that if he doesn’t do something to move ahead, people will see him as a lame duck riding off into the sunset. Once Perry acknowledges that he’s stepping off the stage, the fight for the spotlight will begin and Perry will become an increasingly marginalized figure in Texas politics. Watching the Texas political system work around him while his potential heirs to the governorship step over his body isn’t how anyone wants to spend four years in office. By taking a star turn on the national stage, Perry may actually hold onto his political status in Texas. And, it keeps some hope for a career in national politics and positions him for a seat in the Senate, if his attention turns to Congress.